Live By Night, the novel by Dennis Lehane, as the cliché goes, “comes to the big screen,” starring Ben Affleck. It should be noted that a recent Crimeculture movie review of The Accountant also starred Ben Affleck, and while this does not suggest any preference for this actor by this reviewer, he has been racking up a lot of big screen face time since my favorite, The Town. What both of the aforementioned movies possessed in terms of pace, this rendering lacks. While the story line is one of a good man who becomes “bad”, it takes a while for us to care. Ben Affleck is rejoined with an ensemble cast: Chris Cooper, previously Affleck’s father in The Town, now as Chief Figgis; Brendan Gleeson as Thomas Coughlin, Affleck’s (Joe Coughlin) father and prominent Boston Police Captain; and Zoey Saldana as Graciela, his Cuban love interest. 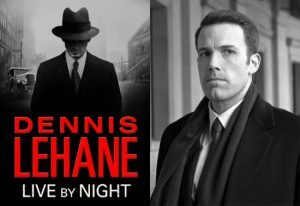 Perhaps Mr. Affleck enjoys playing criminal types steeped in Boston’s historic Irish gangster culture because it’s easy. Frankly, I appreciate the change from rote mafia movies. Generally speaking, there are subtle nuanced differences between the two genres. This film takes place in Florida during prohibition, where for Affleck and his partner, strongly portrayed by Chris Messina (as Dion Bartolo), the deadliest competition is the Ku Klux Klan. Affleck, as previous war veteran, convict and newly minted mob boss, has moved their operation to Florida. Underlying tension grows due to Affleck’s character and Joe Coughlin’s interracial romance with Graciela. Consider this film a mix of HBO’s now defunct weekly series Boardwalk Empire and Brian DePalma’s Scarface (1983), which was an updated version of the 1932 film of the same name starring Paul Muni. Live by Night, as the song suggests, is “A Long and Winding Road.” While the cast is good there are no standout performances save for the previously mentioned Messina and Elle Fanning as Loretta Figgis, previously led astray but now a person of faith. Sienna Miller perhaps displays the strongest performance as the fatalistic heartbreaker Emma Gould. She in part was the impetus for Joe Coughlin’s brutal beating early on and departure to seemingly greener pastures and warmer weather at the hands of Robert Glenister, cast as the ruthless mobster Albert White. Sometimes a book does not translate well into film, since there is simply too much going on. Given the parameters of movie running times, all the aspects of the story cannot be addressed. Suffice it to say that what books are expected to do, films rarely accomplish, and when they do they are lauded. Enjoy it via your favorite streaming service.